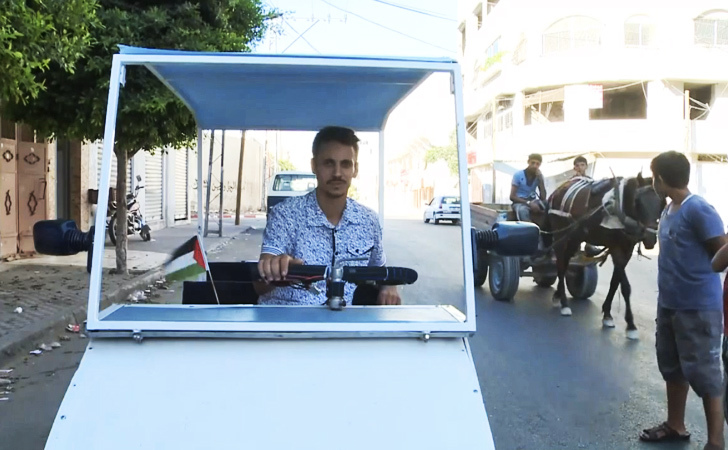 A 32-year-old taxi driver has created Gaza‘s first electric vehicle in the face of a major fuel crisis. Munther al-Qassas decided that investing in an electric taxi would be cheaper and less time consuming than spending hours waiting in line for petrol. Despite holding a degree in political science, Qassas was able to build the car from recycled materials in a workshop on the roof of his home over several months. As a collector of old electronic gadgets, Qassas was familiar with the technology needed to make an EV. He opted to make the car’s frame entirely out of wood, and he salvaged tires from an old wheelbarrow. Due to the limited resources available, Qassas’ electric taxi is only capable of 12 mph at full speed, but it is more than enough to get around the city. Speaking to AFP, the innovative taxi driver said: “I thought about making a car which would suit our circumstances in Gaza, especially with the fuel crisis that forces people to stand in line for hours outside petrol stations or pay a huge amount of money. “I would like to make Gaza self-sufficient with this electric car, or even build a solar car. I’m sure if I was in a different country, I would have received more attention and I would have won some awards for what I do,” he added modestly but highly the fact that there is a serious lack of opportunity for scientific creativity in the Gaza Strip. “We need guidance and encouragement here,” Qassas said. “No one here cares about encouraging young people to study science, or to be innovative and develop their abilities.” The government, he said, should “sponsor young people and encourage scientific creativity”. There are certain drawbacks to the vehicle. For one, it can only carry two people, has limited speed capabilities (as previously mentioned) and has to be charged for five hours with an electric cable after which it can run only for four hours. Still, on the plus side, the car was built entirely from recycled materials! Good for him. My only worry is how long before the Israelis deem it a threat then destroy it. 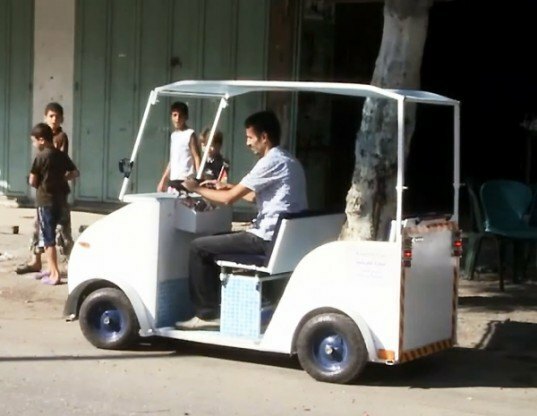 A 32-year-old taxi driver has created Gaza's first electric vehicle in the face of a major fuel crisis. Munther al-Qassas decided that investing in an electric taxi would be cheaper and less time consuming than spending hours waiting in line for petrol. Despite holding a degree in political science, Qassas was able to build the car from recycled materials in a workshop on the roof of his home over several months.